Horcruxes. . Wallpaper and background images in the Harry Potter vs Twilight club tagged: horcrux harry potter. Lol @ Ron as Misty. *reads "how come dumbledore is pikachu?" I almost didn't catch Dumbledore as pickachu. BUT: XDXDXDXDXDXDXDXDXD! That was hilarious. And Ron as Misty and Hermoine as Brock. LOLOLOLOLOLOLOL! My new favorite picture. 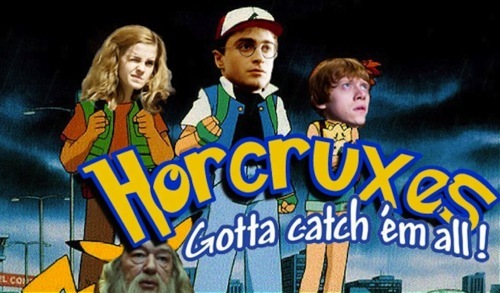 I see that they made Ron as Misty because of the red hair, but...Hermione and Brock-WTF! ?